Defender David Pipe insists there was no falling out with manager Justin Edinburgh following his departure from Newport County. The 30-year-old had already been told his contract would not be renewed at the end of the season. "There was no actual altercation or anything along those lines," Pipe told BBC Radio Wales Sport. "I just wanted people to be made aware it was a managerial decision. "I can respect his decision but that doesn't mean I have to agree with it. "It's a very awkward situation for me, there's no nice way of going about it. "But I'm a big enough man to shake hands and I'll use the negatives from this situation to turn them into positives like I've done in the past." 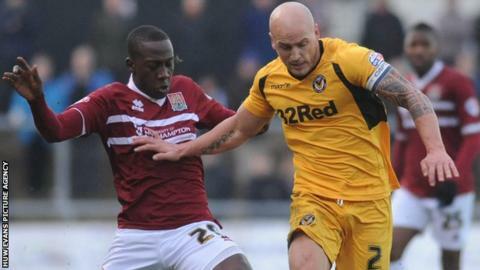 The defender joined County in September 2011 and made over 100 appearances for the Exiles. Pipe, who won one cap for Wales against the United States in 2003, had been informed in February he would not be offered a new deal. The former Bristol Rovers player is now free to look for a new club and feels an early parting of the ways with Newport was the right decision. "Obviously I need to look elsewhere and injury could be a risk," Pipe added. "I think a shake of hands and signing of the correct papers was probably the right way to go about it to be honest. "It's difficult to talk to football clubs when you haven't released yourself from the last football club. "Hopefully over the next few weeks a lot of progress will be made. Certain clubs will know what their budgets are and what league they are going to be in. "Hopefully we can get the ball rolling and go on from there. "I'm 30-years-old and like to think I look after myself well so hopefully I'm in good stead regarding the future. "I'd like to think I can outlast my mates and a few football colleagues on the football pitch."